Fitium is an easy to use online system which helps you lose weight and adopt a healthier lifestyle. We are not a faceless corporation so feel free to get in touch. Not necessarily. We estimate that changes in your diet are responsible for 70-80% of weight loss, so you can lose weight without having to do any workouts. But for best results, and to improve your overall health and fitness we also feature progressive workouts you can do from home, in as little as 10 minutes. What if this isn’t for me? 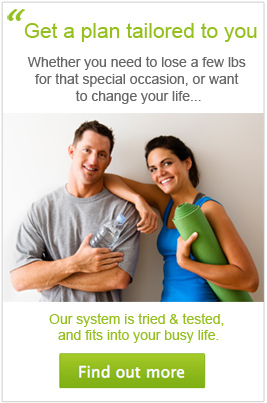 If you don’t love using our system, we have a generous 30 day money back guarantee. Just let us know why you wish to leave and we’ll arrange a prompt refund (and try to do better next time!). In any case, do get in touch if you run into any issues as we are here to help. How is fitium different from meal tracking tools, and food diaries? Tracking foods can be time consuming, and only let you report on what you eat. We take a completely different approach, and provide you with personalised meal plans tailored to your body’s needs, and your diet goals. This takes away the problem of what to eat, and which portion sizes to use. How is fitium different from other online diets? The first two types of diets will only work for a small subset as they depend on all customers having the same weight gain problem, and genetics. For example many big diet corporations say they offer personalised diet plans, but actually let you pick from a list of plans, and just change the portion sizes to meet your daily calorie needs. In other words you are getting the same meal plans as everyone else! Fitium is different and uses over 35 different data points to design a unique diet plan designed to help maximise natural weight loss. Do you have work friendly meal options for lunch? Yes, most of our lunch meal plans can be prepared in advance and taken to work in a lunch box. You can also easily log ready made meals, or foods bought at the shops if taking a pre-prepared meal is not an option.